Dig in the Dirt and Practice Spanish! All Spanish students in The Language Link programs from La Casita’s preschool students through our middle school Global Worskhop students are invited to help care for our Global Youth Garden. 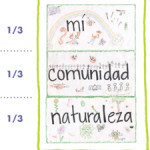 It is a wonderful way to learn about land stewardship, working together and practicing Spanish! The Language Link Spanish students meet weekly to garden together as part of our Global Youth Garden program, Tierra de Niños (TiNi). Older students who have worked in the garden in previous years are invited to serve as mentors, teaching our younger students about the Incan gardening philosophy by which we tend our garden. Tierra de Niños educates students about giving back to the community while also caring for nature and their surrounding environment. This philosophy divides the garden into thirds: one-third for the gardener, one-third for the community, and one-third for nature. 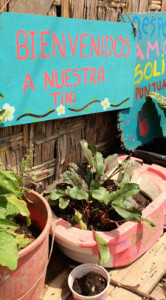 During their time in the garden, students have the opportunity to speak only Spanish as they learn new vocabulary related to gardening. The students discuss and decide where in the community to donate the thirds of the garden harvest. The program opens every year on Earth Day, April 22, with planning and preparing the garden. Through spring and summer the students weed, water, harvest and participate in fun activities in Spanish lead by Program Coordinator Jessica Pierard. At the end of October, there is a final fall harvest and students put the garden “to bed” for the winter. If your student would like to participate, please contact Jessica Pierard at 206-282-0162.